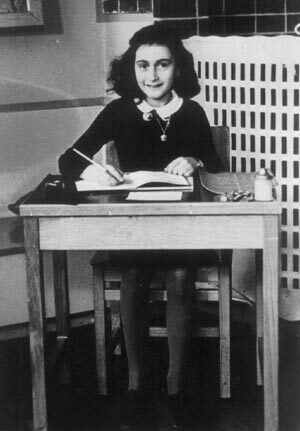 One of the most famous Jewish victims of the Holocaust, Anne Frank penned one of the world's most powerful accounts of Jewish life during World War II. Although Anne's diary did not pertain directly to the Holocaust, its readers became personally acquainted with one of the millions of Jewish victims of Nazi persecution, and the immense horror and tragedy of the Holocaust was transformed into a personal event. 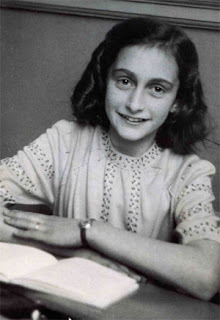 Anne (Annelise) Marie Frank was born on June 12, 1929, in Frankfurt, Germany, to Otto and Edith Frank, both of whom came from respected German Jewish families. Anne and her older sister Margot grew up in a Germany that was becoming increasingly hostile to Jews, and the hostility worsened when the anti-Jewish National Socialist party led by Adolf Hitler came to power in 1933. Realizing that the situation for Jews in Germany was becoming perilous, Otto Frank went to The Netherlands to set up a branch of his brother's company, the Dutch Opekta Company, in the city of Amsterdam. His family joined him soon after, and by the mid-1930s, the Franks had settled into a relatively happy existence free of persecution for their Jewish heritage. Anne quickly adapted to life in the new country and developed many friendships with Jewish and non-Jewish children alike. In 1939, the uneasy peace in Europe was shattered when German military forces began invading other European countries. World War II had commenced. In May 1940, The Netherlands surrendered to Germany and was quickly brought under the rule of German occupation. The Netherlands could no longer protect its Jewish population from Nazi persecution, and the occupying Nazi administration issued increasingly severe anti-Jewish decrees to isolate the Jews from the rest of the Dutch population. All Jews had to register their businesses and later surrender them to non-Jews. Otto Frank turned his business over to his non-Jewish colleagues, Victor Kugler and Johannes Kleiman. In 1941, Anne and Margot were no longer allowed to attend school with non-Jews. By 1942, all Jews aged 6 and older were required to wear a yellow Star of David on their clothes to mark them as Jews. Soon, Dutch Jews were being rounded up and deported to Westerbork prison camp in the northern Netherlands. Meanwhile, Otto Frank was preparing the upper floors of the back annex attached to his office as a secret place where his family could hide from Nazi officials and sympathizers and escape deportation to the labor prison camps. He had solicited the help of Kugler and Kleiman as well as office workers Miep Gies, Jan Gies, and Bep Voskuijl to sustain them in hiding during the Nazi occupation. When Margot received a deportation notice on July 5, 1942, the family immediately went into hiding. The Franks were joined a week later by Otto's Jewish business partner Hermann van Pels, his wife Auguste, and their son Peter, and in November, by Fritz Pfeffer. Through the social turmoil of the Nazi occupation, Anne tried to go on with her life as usual, but she keenly felt the discrimination and isolation imposed upon herself and the other Jews. When Anne's parents gave the lonely girl a diary for her 13th birthday, she was thrilled and began writing in it right away. The diary, which she named Kitty, was to become one of the most poignant memoirs of Jewish life during World War II in occupied Europe. For over two years, the hideaways in the annex shared a confined space and lived under constant dread of detection by the Nazis. A hinged bookcase was all that separated the occupants of the annex from the outside world, and it was through this door that Miep and Bep passed along scant food and news to the eight people. Despite the discomforts, they tried to lead as normal a life as possible. For Anne, Margot, and Peter, this meant studying and doing homework. During the years in hiding, Anne developed from a girl into an adolescent who harbored uncommon depth and complexity, and her diary became her best friend and confidante. She described the ups and downs of daily life in hiding and was candid about the others and unusually honest about the changes in herself. She wrote some of her diary notations into little stories, and rewrote a large portion of her diary from March to August 1944 after learning from a Dutch Free Radio broadcast that her diary could be of historical interest to others. The diary entries portrayed the adolescent Anne as a smart, free-spirited girl with a keen interest in boys and in cinema, who remained optimistic and dared to dream glamorous dreams despite her harrowing confinement. As 1944 progressed, the annex occupants became more and more hopeful that the defeat of the Axis powers was at hand, and dreamed of returning to a normal life. But on Aug. 4, 1944, a Nazi policeman and several Dutch collaborators raided the annex after receiving a tip from an informant. The residents of the secret annex were arrested and sent to Westerbork; a month later, they were on the last transport ever to leave Westerbork for Auschwitz concentration camp in Poland. Mrs. Frank died of starvation at Auschwitz. In October, Anne and Margot were transported from Auschwitz to Bergen-Belsen concentration camp in northwest Germany. There, the sisters soon contracted typhus, and the two died within weeks of each other in March 1945, a month before the camp was liberated by Allied troops. Otto Frank was the only resident of the annex to survive the Holocaust. Anne's notebooks were found scattered on the floor of the empty hiding place by Miep Gies and Bep Voskuijl after the raid. Miep kept the diary in hopes of returning it to its owner, but she gave it to Otto when she learned that Anne had died. Following the suggestion of friends, Otto decided to publish Anne's diary, and in 1947, the diary—under the title ‘Het Achterhuis' (The Secret Annex, the title Anne had chosen herself)—was published in The Netherlands. Eventually, the diary was translated into more than 55 languages and became one of the most widely read books in the world. The popularity and emotional resonance of Anne Frank's diary even led to dramatic renditions of the events recorded in the diary. A successful stage production of the Pulitzer prize-winning play, ‘The Diary of Anne Frank', premiered in 1955, and a film adaptation of the play was released in 1959. In 1957, when the demolition of the secret annex was imminent, a number of prominent citizens of Amsterdam established the Anne Frank Foundation to preserve the annex on Prinsengracht 263. The house was transformed into a museum known as the Anne Frank House. On the 50th anniversary of her death, Anne Frank became the subject of renewed public attention. The Anne Frank Educational Trust initiated the making of a film to commemorate her life and death. The result was the Academy award-winning documentary ‘Anne Frank Remembered' (1995), which tells the story of the Frank family and presents a three-dimensional portrait of Anne through interviews of Anne Frank's friends and schoolmates and never-before-seen archive footage. Also in 1995, a definitive edition of Anne Frank's diary, which included excerpts left out of the original version, was published by Doubleday. The continued public interest in the life and tragic death of Anne Frank was a testament to her enduring legacy of hope and humanity in the face of fear and evil. Nació en Fráncfort del Meno (Hesse, Alemania), siendo la segunda hija de Otto Heinrich Frank (12 de mayo de 1889 - 19 de agosto de 1980) y su mujer Edith Hollander (16 de enero de 1900 - 6 de enero de 1945), una familia de patriotas alemanes que habían participado en la Primera Guerra Mundial. Tenía una hermana mayor, Margot Frank (16 de febrero de 1926 - 9 de marzo de 1945). Junto con su familia, tuvo que mudarse a Ámsterdam, huyendo de los nazis. Allí le regalaron un diario al cumplir los trece años. Muy poco después, su familia tuvo que ocultarse en un escondrijo, la Achterhuis, situada en un viejo edificio en el Prinsengracht, un canal en el lado occidental de Ámsterdam, y cuya puerta estaba escondida tras una estantería. Allí vivieron durante la ocupación alemana, desde el 9 de julio de 1942 hasta el 4 de agosto de 1944. En el escondite había ocho personas: sus padres, Otto y Edith Frank; ella y su hermana Margot; Fritz Pfeffer, un dentista judío (al que Ana dio el nombre de Albert Dussel en su Diario), y la familia van Pels (van Daan en el Diario), formada por Hermann y Auguste van Pels y el hijo de ambos, Peter. Durante aquellos años, Ana escribió su Diario, en el que describía su miedo a vivir escondida durante años, sus nacientes sentimientos por Peter, los conflictos con sus padres, y su vocación de escritora. Pocos meses antes de ser descubiertos, empezó a reescribir su Diario con la idea de publicarlo tras la guerra. Después de más de dos años, un informador holandés guio a la Gestapo a su escondite. Fueron arrestados por la Grüne Polizei y, el 2 de septiembre de 1944 toda la familia fue trasladada en tren de Westerbork (campo de concentración en el noreste de Holanda) a Auschwitz, viaje que les llevó tres días. Mientras tanto, Miep Gies y Bep Voskuijl, dos de los que los protegieron mientras estuvieron escondidos, encontraron y guardaron el Diario. Ana, Margot y Edith Frank, la familia van Pels y Fritz Pfeffer no sobrevivieron a los campos de concentración nazis (aunque Peter van Pels murió durante las marchas entre campos de concentración). Margot y Ana pasaron un mes en Auschwitz-Birkenau y luego fueron enviadas a Bergen-Belsen, donde murieron de fiebre tifoidea en marzo de 1945, poco antes de la liberación. Sólo Otto logró salir de los campos de concentración con vida. Miep le dio el diario, que editaría con el fin de publicarlo con el título Diario de Ana Frank, que ha sido ya publicado en 67 idiomas. El memorial en honor a Ana y Margot Frank está en el lugar donde estaba la fosa común correspondiente a la barraca donde murieron en el campo de concentración de Bergen-Belsen.